Now is the time to consider your requirements for autumn sports pitch renovation work including Harrowing, Fertilizer application, Aeration, and Over-seeding. 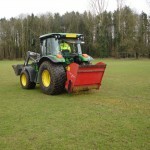 Seasonal pitch renovation work is essential to maintain a quality-playing surface throughout the year. Now is the time to consider your requirements for autumn sports pitch renovation work including: Harrowing, fertilizer application, aeration, and over-seeding. Seasonal pitch renovation is essential to maintaining a quality-playing surface throughout the year.